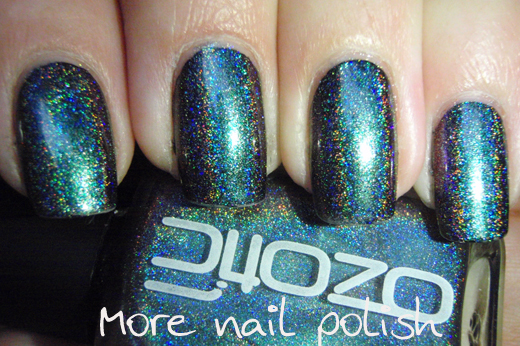 Finally, here is a swatch of one of the new Ozotic Mish Mash polishes. I got all four and will post a new one each day. They are all holographic multichromes and they are all of the same high quality as the other Ozotic polishes. But I do have a couple of things to say about these up front. 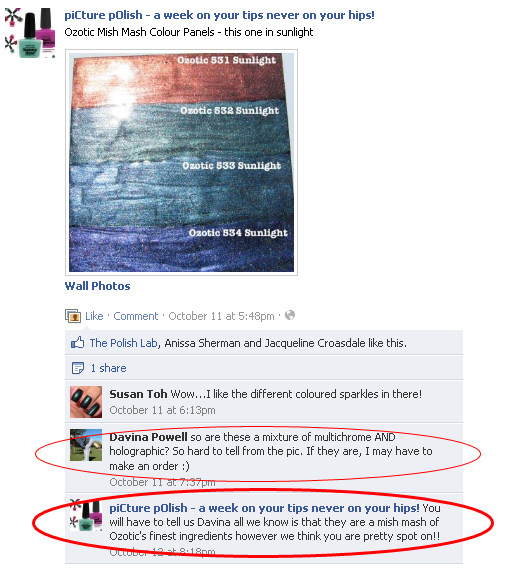 Firstly, any long term readers of my blog would know that a holographic multichrome isn't a new or original idea. Why? Cause I did it first, nearly four months ago. I added Spectraflair to Ozotic 505, which I tell you is exactly what Ozotic has done with this polish, and the others in the Mish Mash range. Given that all the Ozotic polishes are made with JDSU Chromaflair pigments, I reckon I could say rather confidently, the holographic pigment in these is also a JDSU product, specifically Spectraflair. Q: So are these a mixture of multichrome AND hologrpahic? A: You will have to tell us Davina all we know is that they are a mish mash of ozotic's finest ingredients however we think you are pretty spot on!! Seriously, you're selling these and you don't even really know what they are? And sorry, but what is with that swatch, how the hell is that suppose to help us choose which polishes to get? Why not try a nail wheel at least? Now onto the swatch, which I know is what you really want to see. These are not my best swatches I'm sorry to say. It's been overcast ever since I got these in the mail, so they are taken indoors, with diffused light from the window, with the macro LED light on my camera. These polishes are also a little tricky to photograph because, holos look best in lots of light, yet multichromes look best in the shade. Mish Mash 532 is the holographic version of Ozotic 505. That is, it shifts from a turquoise green base to purple. But of course, this one also has the rainbow prism across the nail. All these show two coats over a black base. Wear was excellent. These swatches were taken on day two, and the macro shows a little tip wear, but that is usually for me. Formula on these was just like applying the multichromes, perfect. So if you love 505 and holo polishes, your gonna love this one. But if you already have 505 (or Sally Hansen Turquoise Opal) and you have some Spectraflair, you could always franken up your own bottle and save the $14. Come back tomorrow for 533. Huh. That's a slight let down. 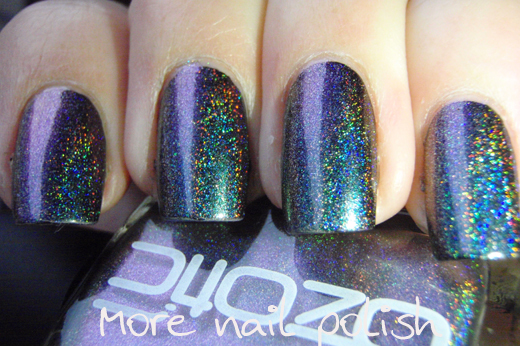 I would have liked to see Ozotic do more multi-chromatic polishes or other color holos. Seems cheating to mix two already created polishes to make a new one. Bummer though I still feel the need for them. The multi-chromatic holo isn't new at all. I had a few polishes in the 90's that were the same concept. Not as elegant as today's polishes but the idea was the same. I wish I still had them! It's nice to see Spectraflair getting so much use since I first blogged about it. Yay! I have to start frankening my polishes ASAP! That one is such a nice colour!!! KrisInPhilly - Oh what a shame you don't have those 90's polishes anymore!! And Thank you again, it's cause of your first post about spectraflair that I got so into frankening!! I actually used them up! Can't remember the last time I did that. You have done some amazing frakens. I have a number of your posts favorited for future reference. I think of you as the "Holo Queen" in my head. I think you need a tiara. Thanks for the swatches... MUCH easier to see what they're actually selling! Also, if you have time I'd love to see a comparison between your frankened holo-duo, the mish mash and the regular ozotic 505 with spectraflair top coat... I have 505 and SFTC so I don't know if I will bother to purchase the mish mash ones. I know, I sent an email asking about them and I got the exact same response with the exact same photo which does not show any holo at all. Since I didn't have any of the Ozotic multichromes, I ordered all four of the Mish Mash from llarowe anyway after Leah Ann posted quick swatches on her FB page. Oh how I wish you would just open shop and sell your awesomeness and put them to shame!!!! Will need to check these out! WTF, what are those awful "swatches" they have?! Did they just paint it on paper? Definite rip off of yours... kind of wrong! Did you use a topcoat on this? Nope - totally smooth, doesn't need a topcoat.